Ford Mondeo Boot Space, Size, Seats | What Car? 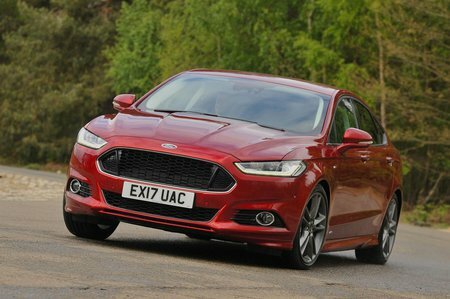 The Mondeo is hugely spacious in the front, so even the tallest adults will be more than comfortable; it’s noticeably roomier than the BMW 3 Series and roughly on a par with the Skoda Superb. 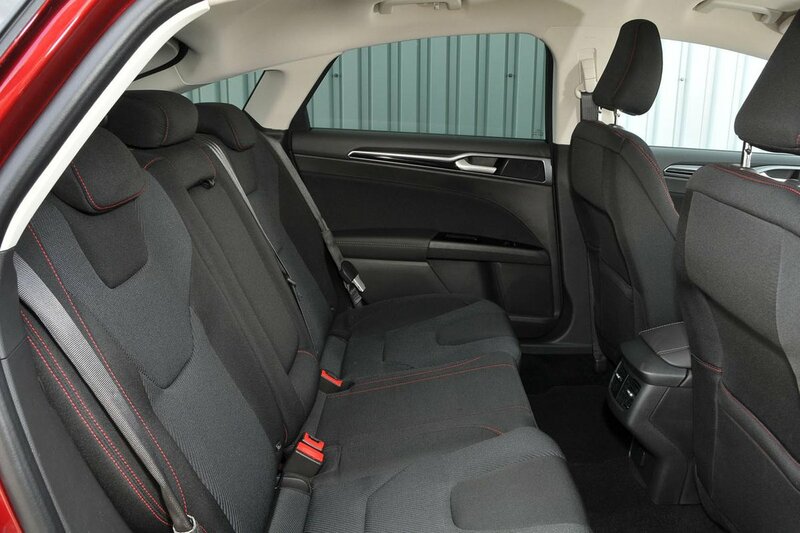 The interior is broad, too, so there’s plenty of room between you and your passenger. The door pockets on either side are deep and wide, meaning you can fit a 1.5-litre bottle on its side in each, and the two large cupholders between the front seats keep large takeaway cups steady. There’s also a sizeable glovebox, a shallow tray in front of the gearlever that’s ideal for small items and a deep central cubby that houses the USB sockets and is an ideal place to stow your phone. The Mondeo doesn’t have quite as much rear leg room as the gigantic Superb, but it is fractionally broader and there's more than enough space to accommodate two average-sized adults in comfort. Particularly tall people will find head room a bit tight, mind. You can fit three in the back reasonably easily, although whoever sits in the middle gets a rather uncomfortable rounded seat to sit on. When it's just two in the back, the standard central armrest with two cupholders is suitably handy, plus the sizeable door bins allow you to stow a 750ml bottle of water either side of the car. There are map pockets on the backs of the front seats, too. There’s nothing particularly clever about the Mondeo's seats.. Yes, the rear backrest splits in a 60/40 arrangement and the two halves are easy to fold down using buttons next to the outer head restraints, but you can do the same thing in the vast majority of rivals, including the Superb. You also get a ski hatch – a small door in the middle of the rear bench that you can feed long items (such as skis) through and keep the two seats either side free for passengers. 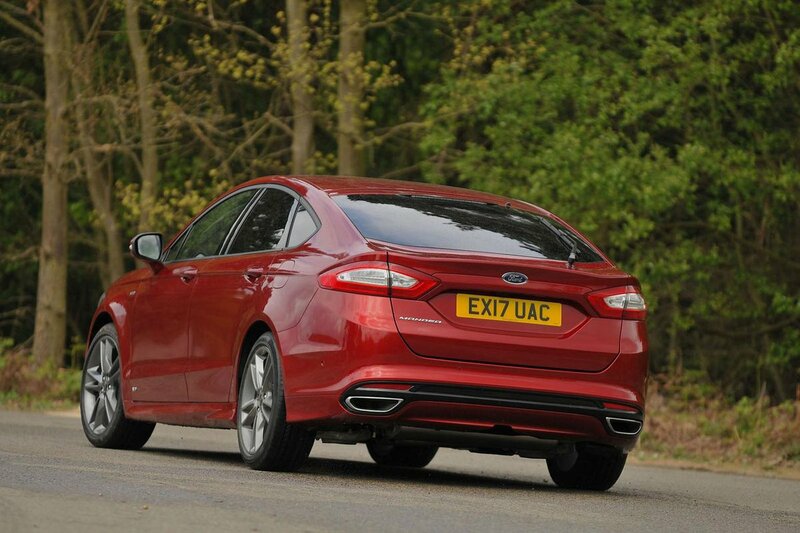 The Mondeo has a suitably big boot with a broad hatchback opening. You're unlikely to want for more luggage space, even if you decide to go camping with the family, although it's worth knowing that you'll fit even more in the boot of a Superb. It’s just a shame that the Mondeo isn't available with a height-adjustable boot floor; instead, there’s a step down to the floor from the fairly high lip at the entrance, and up again to the rear seats when they're folded down. Meanwhile, the hybrid model has a saloon boot opening rather than a hatchback, so it's less practical.